We are a well established family business trading for over 30 years from a modern bakery unit in the beautiful Teign Valley. 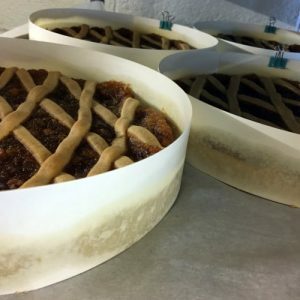 Shirley and Bob Hicks and their team pride themselves on their extensive product list of traditional English and continental handmade desserts. Always reliable and most importantly completely delicious! Pies and Tarts, Crumbles, Cheesecakes, Tray Bakes, Continental Style Gateaux, Traditional Cakes, a Range of Quiche and Seasonal Specials. Cakes and Desserts for all occasions, from large scale events to the smallest gathering, talk to us about our fantastic range of services and produce.